Time goes by a little slower, pineapple tastes a little sweeter, and the water is a little clearer on Gili Trawangan- Gili T for short. This micro-sized 3k long and 2k wide island off the coast of Lombok is truly an oasis. Gili T is traversable only by foot, bike, or horse drawn carriage as motor vehicles aren’t allowed on the island. Without the rumble of engines, the ocean lapping the shore is that much more audible. Although it certainly isn’t the only island oasis Indonesia has to offer, Gili T may be one of the easiest to reach and navigate as a tourist. Here are some not-to-be-missed experiences that the island has to offer. Gili Trawangan has the best access to diving and snorkeling spots in the area, which include a Japanese shipwreck, extensive coral reefs, and some of the warmest and clearest water around. Sea turtle sightings are common. I had the pleasure of swimming with a sea turtle for about 45 minutes, and it is something I will never forget. Diving trips can be arranged through hotels while snorkeling is best organized directly with company booths near the beach. Some of the best and freshest seafood is served up nightly at the Night Market. It is probably the most authentic Indonesian experience on the island as traditional cooking methods, sauces, and dishes come to life in a busy marketplace environment. Gili T has some of the best sunsets I have ever seen. Almost every evening the sky is painted with the most vivid reds, pinks, and golds. They are truly breathtaking. Gili T is small. Walking or biking around the entire island takes only a few hours, and is a great way to get a feel for the island as a whole. Quiet beaches can be found, local life can be observed, and little cafes can be enjoyed. The island also has a ton of murals and street art done by very talented local artists. Pearl Beach Lounge, Villa Ombak, and Laguna resort pop up screen s and projectors in the evenings. Moviegoers can enjoy recent releases, popcorn, and drinks in beanbag chairs right on the beach. If you like movies, unwinding with some cinema on the shore is an experience not to be missed. A Balinese massage is a must-have experience for anyone who enjoys relaxation and pampering. After the all the sun and salt, recharging with some tissue treatment is that much more amazing. Spa Ottalia is one of the best on the island. Gili T is best taken in with the sand betwen your toes and a mango margarita in hand. Villa Ombak Sunset Swings provide the postcard perfect picture opportunity. Although sunset is one of the most popular times snap photos, the daytime is when you can actually swing (tide allowing). Pronounced Chimodo, these horse drawn carriages are the only form of transportation on the island with more than 2 wheels. The heavily decorated horses, pull brightly colored carts with benches inside. It can be a fun/romantic way to see the island. Making a day out of hopping between the other two Gili Islands: Gili Air and Gili Meno by boat can be super fun. Each island has subtle differences in beaches and landscape, snorkeling spots, and countless more restaurants to try. 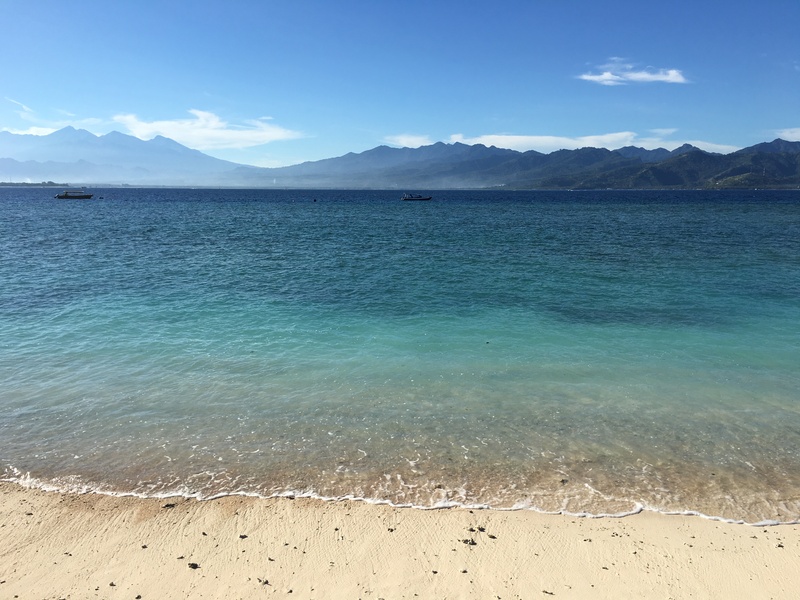 Accomodation: ” You get what you pay for” is the rule around Gili T, and a little goes a long way in Indonesia, so I encourage you to splurge if you can to be closer to the beach and have the best breakfasts. Family/ Quiet Stay: Gili Eco Villas – located on the “quiet side” of the island these villas are beautiful and have great options for groups. Backpackers/ Budget: Alhambra Homestay – basic, but friendly and safe homestay with a light breakfast, perfect for budget travel. Wow, this sounds fantastic! I’m so happy you’ve had a WONDERFUL Summer!